Dinerware is a reliable, flexible, and smart restaurant POS software to the hospitality industry. It enables food businesses to reduce ordering times so staff are able to entertain more guests. This means an increase in profitability for businesses and a swift customer service for diners. Moreover, Dinerware provides a mobile POS to food establishments. This enables staff to process payments quickly and on-the-go. With this system, employees have freedom of movement on the floor and owners are conferred flexibility on how to run their business. Furthermore, Dinerware works not just for brick-and-mortar restaurants, but for mobile food trucks as well. This allows them to take their businesses wherever they are with a POS system that works as well in ambulatory mode. With Dinerware, restaurants and mobile food trucks spend less time tinkering with a POS machine and more time catering to customers. The software allows owners and their staff to conduct business smoothly and places the tools and features they need within easy reach of their fingertips. Dinerware is a powerful yet easy-to-use POS system. Restaurants new to it find that transition is seamless and training does not take long. This allows them to utilize the software for their operations as soon as it is set up. Dinerware easily adapts to the unique needs of every food establishment. The system allows users to move things around on the interface and design the software in a way that works for them. Furthermore, Dinerware also works for different kinds of hospitality business. Bars, restaurants, food trucks, and more find that the application is flexible and is pliant to their needs. Dinerware is also available for mobile devices such as tablets so that servers have access to an ambulatory POS system. This allows them to serve customers wherever they are on the floor and the system also facilitates the quick checkout of diners. If you are interested in Dinerware POS it might also be a good idea to examine other subcategories of Best Restaurant Management Software collected in our base of B2B software reviews. Since each enterprise has specific business wants, it is sensible for them to abstain from searching for a one-size-fits-all faultless software system. Needless to say, it would be useless to try to find such a system even among popular software solutions. The smart thing to do would be to catalog the various important factors that need consideration such as required features, finances, skill levels of employees, company size etc. Then, you should do your homework thoroughly. Read some Dinerware POS reviews and investigate each of the other solutions in your shortlist in detail. Such exhaustive homework can ensure you discard ill-fitting applications and choose the solution that presents all the features you need for business success. How Much Does Dinerware POS Cost? We realize that when you make a decision to buy Restaurant Management Software it’s important not only to see how experts evaluate it in their reviews, but also to find out if the real people and companies that buy it are actually satisfied with the product. That’s why we’ve created our behavior-based Customer Satisfaction Algorithm™ that gathers customer reviews, comments and Dinerware POS reviews across a wide range of social media sites. The data is then presented in an easy to digest form showing how many people had positive and negative experience with Dinerware POS. With that information at hand you should be equipped to make an informed buying decision that you won’t regret. What are Dinerware POS pricing details? 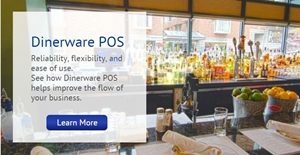 What integrations are available for Dinerware POS? If you need more information about Dinerware POS or you simply have a question let us know what you need and we’ll forward your request directly to the vendor.